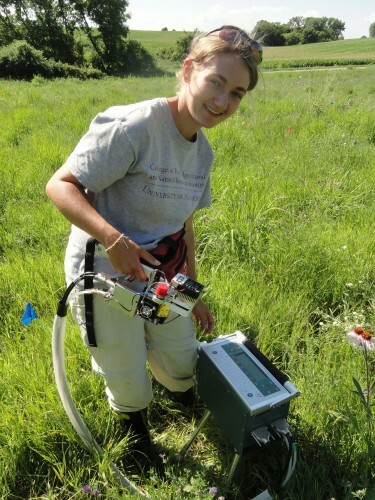 Reina, Hattie, and Mike with the instrument used to measure photosynthesis in 2013. In 2017, of the original 557 plants in INB1, 180 were still alive. Of the plants that were alive this year, 7 (4%) were flowering and 23% have never flowered. Interestingly, there are differences in survival for each cross level. 21% of the most inbred plants were living in 2017, compared to 39% of the plants in the between remnant cross level. All individuals were planted in 2001. The INB1 experiment investigates the relationship between inbreeding level and fitness in Echinacea angustifolia. Each plant in experiment INB1 originates from one of three cross types, depending on the relatedness of the parents: between maternal half siblings; between plants from the same remnant, but not sharing a maternal or paternal parent; and between individuals from different remnants. 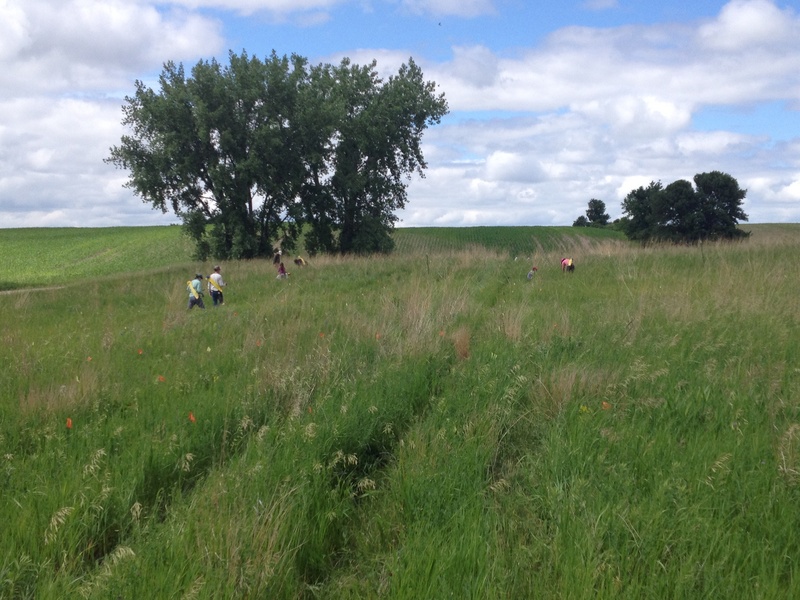 We continued to measure fitness and flowering phenology in these plants. Physical specimens: We harvested 6 heads from INB1 that will be processed in the lab with other heads harvested from P1. Data collected: We used handheld computers to collect fitness data on all plants in INB1. You can find more information about the Inbreeding experiment–INB1 and links to previous flog posts regarding this experiment at the background page for the experiment. 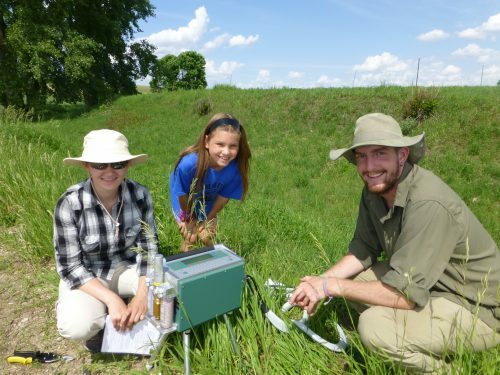 Reina, Hattie, and Mike with the instrument to measure photosynthesis. In 2016, we continued the INB1 experiment to investigate the relationship between inbreeding level and fitness in Echinacea angustifolia. Each plant in experiment INB1 originates from one of three cross types, depending on the relatedness of the parents: between maternal half siblings; between plants from the same remnant, but not sharing a maternal or paternal parent; and between individuals from different remnants. We continued to measure fitness and flowering phenology in these plants. This year, of the original 557 plants in INB1, 191 were still alive. Of the plants that were alive this year, 7% were flowering and 24% have never flowered. Physical specimens: We harvested 13 heads from INB1 that will be processed in the lab with other heads harvested from P1. The functional trait machine used in the Kittelson et al. paper. In 2015, we continued to study the effects of inbreeding on Echinacea angustifolia fitness. This experiment was planted in 2001 where each plant was produced from one of three cross types, depending on the relatedness of the parents: between maternal half siblings; between plants from the same remnant, but not sharing a maternal or paternal parent; and between individuals from different remnants. We continued to measure fitness and flowering phenology in these plants. This year, of the original 557 plants in INB1, 157 were still alive. Of the plants that were alive this year, 23.4% were flowering and 24.9% have never flowered. Among the plants that were flowering, average head counts was 2, with a maximum of six heads. Products:The team collected fitness measurements during our annual assessment of fitness in all plants in P1.